Not much is known about the Crane Wreck. It is a crane that fell off a barge, along with some dredging equipment during a storm. The sunken barge can be located a relatively short distance off from the wreckage of the Crane. The Crane is a very pretty dive – with typical New England marine life calling the wreck home. 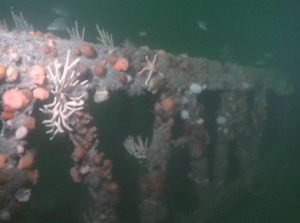 On a day with good visibility, looking through the anemone covered scaffold-like crane arm is an awesome sight. The wreck is small, with the tracks upside down, but vertically oriented. The crane arm is twisted over on its side – with some supporting structure off in the sand. The top of the wreck is at about 130 feet, with max depths of about 150 feet at high tide.